Two years ago I was in France for work. I spent November 11th in Nantes, taking an unexpected holiday before moving to Paris. In America this is Veterans Day, a mix of military tributes, honest reflection, camouflaged NFL players and retail discounts. 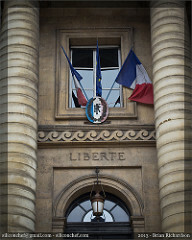 In France it’s Armistice Day, and the entire country closes down for a solemn day of remembrance. Yes, Americans paid a heavy price in the two World Wars that swept across Europe. But we went to war, drawn in by an attack on one front and calls for assistance on another. France didn’t go to war … war came to France. Paris was an occupied city, inspiring an underground resistance to try and restore the city lost to unfortunate political agreements. The difference is staggering when it comes to memorials and reflection. Countries think differently about war and violence when it actually comes to their doorstep. You may not agree with everything that France does as a government, but don’t count them out as a people. If you think I’m wrong, go to Paris for Armistice Day. Watch a country actually reflect on war. You’ll see less camouflage and more red, white and blue. You’ll see as many memorials to foreign fighters as you will for native sons. When it comes to peace and freedom, Americans have more in common with the French than you think.